A few weeks ago METRO Houston board member Christof Spieler posted some pictures from a recent trip to Detroit. 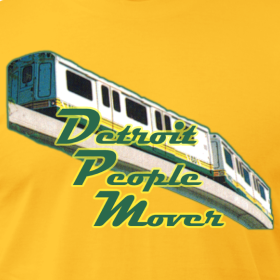 Like any visitor to Detroit, Mr. Spieler commented on the misunderstood and seemingly useless Detroit People Mover. It only takes a few minutes to ride the 2.9 mile loop through Downtown Detroit, but it gives you an opportunity to see different parts of Downtown Detroit, and it actually makes downtown navigation quite easy if you're headed to a concert or sporting event, especially in those cold Michigan winters. It has a certain understated charm. Given my Metro Detroit roots, nothing gets me riled up like criticisms of Detroit. Not to be misunderstood, the People Mover is probably one of the biggest blunders in public transit history. It's both loved and hated by Detroiters, and is even the subject of a Down With Detroit T-shirt. Captions from Down With Detroit detail Detroit's "Misguided attempt at being a major city, instead of putting light rail, we got a tour guide style monorail, only useful if you are going in a circle downtown." But Detroit may have just happened to be on the bad side of transit history luck. It surely wasn't the only city that applied for a Downtown People Mover (DPM). 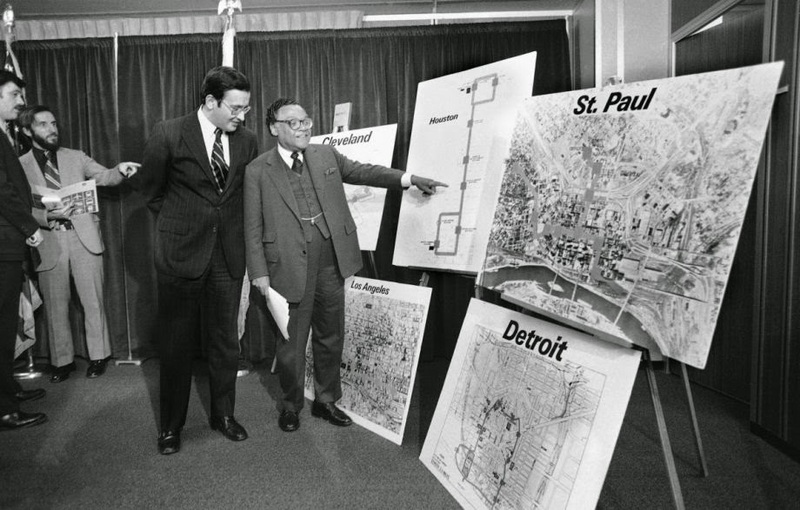 As chronicled in this 2011 City Lab post from Eric Jaffe, Detroit was just one of the approximately 70 cities that applied for federal funding to build a people mover system in the early 1970's. Jaffe notes that "The idea for the people mover emerged in response to amendments in the Urban Mass Transportation Act of 1964, which called on the housing and urban development agency to encourage new systems of urban transportation that will carry people and goods within the metropolitan area speedily, safely, without polluting the air, and in a manner that will contribute to sound city planning." In 1966, the Urban Mass Transportation Administration (UMTA) was created, and it became responsible for developing new forms of transit. way systems, such as subways. "Tomorrow's Transportation: New Systems for the Urban Future" was a 1968 report that intended to ease the transit problems of Americans who live in or commute to cities. A DPM was just one of the recommendations made in the report, along with the seemingly Jetson-like personal rapid transit proposal, personal capsules, and the moving belts. We can be thankful that many of the report's findings never made it any further. What resulted were proposals for DPM's from some of America's largest cities. The UMTA received and selected proposals from Los Angeles, St. Paul, Minnesota, Cleveland and our very own Houston. These were the four cities that were to receive federal funding to build a people mover system in their downtown. But a short time later Houston and Cleveland withdrew their applications, and St. Paul voters turned down the project. Miami and Detroit were chosen as alternate cities, and were the only two projects to result in built people movers. What would a Downtown People Mover have looked like here in Houston? The City of Houston's 1976 proposal to the UMTA called for a 1.09 mile system, composed of 2.25 lane miles of track bisecting the "heart of the downtown core", stretching from the Cullen Center to the Harris County complex. It was intended to be fully owned, operated, planned and financed by the City of Houston, and was said to garner "strong and wide local support". As one of the four cities chosen for the DPM program, the system was "viewed locally as a highly visible first step to improve public transit in Houston", and it was expected to be the central element of a city transit system. Houston was reported to receive approximately $33 million to build their people mover, hoping it would "serve a rapidly expanding market for internal daytime circulation trips, and would stimulate new growth and development in the older north end of the city." In the original proposal, the DPM was expected to attract 24,000 ADT, or over 20,000 passengers per system mile. To gain some perspective, Houston's METRO rail 12.8-mile Red Line carries about 41,000 riders per weekday in 2014, or approximately 3,200 riders per mile per day. These ridership estimates seem wildly optimistic, especially for circulation in such a small area. By 1985, the project was intended to service 8.5 million riders per year, or an average of just over 33,000 trips per day, with an estimated 74 percent of those trips being made going to and from work. A major aspect of the DPM proposal was how a "DPM can act as a distributor for regional bus transit." It was an objective of the "City's transit program to intercept automobile traffic in the suburbs or to provide direct express service rather than to encourage auto use in the downtown." For those that currently work in Downtown Houston, we all know that these goals were not met. Proposed route maps show eight stations starting at the Cullen Center, and extending clockwise to the Allen Center, the former Foley's Department Store, the Bank of the Southwest Building at 919 Milam, to the Pennzoil Building and Jones Hall, a North Main Terminal near Market Square, and looping over to the Harris County Courthouse, and back down to the Exxon Building before returning back to the Cullen Center. The City of Houston contracted Sperry Systems Management and Howard R. Ross Associates to put together a preliminary report for a people mover. The report set out to "review some of the transportation problems facing downtown Houston", "discuss how a people mover could alleviate problems of access and circulation, and could interface effectively with downtown stations of the rail transit system when built." The report contains a variety of possible people mover routes, with one route extending north and south along both Main and Smith, looping between Prairie and Pease, and another route extending from east to west generally along Dallas and Walker, looping just to the west of US-59, through what is now Discovery Green and the George R. Brown Convention Center. It is noted that the routes are for illustration only, but that these routes provided an extended range for lunchtime shopping and dining. And, with the availability of a climate controlled-circulation system, riders would not be limited by fatigue and discomfort. Some of the most interesting content of the preliminary report is the projected transit use in Houston. The plan recognized that Houston, and the downtown core in particular, would see continued growth in the number of trips taken by commuters. The preliminary report notes that only about 35 percent of the anticipated growth in trips would be able to be absorbed by the freeway system. The report made a claim that by 1990, transit must account for 40 percent of the trips to and from the downtown area. According to the 2013 Central Houston Commute Survey Report, this is in stark contrast to conditions now as nearly 57 percent of workers in Downtown Houston drive into work alone, and another 9 percent use some sort of car pool or van pool. That means that 68 percent of Downtown Houston workers are arriving to work in a vehicle. This falls well short of the projected transit goals laid out in the preliminary people mover report. The 2013 Central Houston report actually concluded that a greater number of people drove along in 2013 than in 2009, as "More downtown workers drove alone, and fewer chose public transit, vanpools, or carpools." In 1978 steps were made to create an interim regional transit authority, following provisions by Texas State Legislature. Immediately after its formation, the authority put together what was called the "METRO Plan", highlighting near-term and long-term transit improvements in the region. As a result of the authority's planning, the Houston Office of Public Transit decided that the DPM plan should take a backseat. Finally, on August 12, 1978, Houston area residents voted to create the Metropolitan Transit Authority of Harris County (METRO). METRO's board of directors "determined that the function of the DPM had to be re-examined in the light of the new regional transit authority committed to implementation of the METRO Plan." The DPM was no longer viewed as the focal point for transit within Houston. It might, at best, simply be an integral part of a regional transit system. What resulted was a Downtown Mobility System (DMS) Study. This study still considered the DPM as part of what was called Automated Guideway Transit, as well as the birth of Bus Priority Systems, which impact on Houston's traffic today. The METRO board felt that they should give up their DPM program status to allow cities with more pressing needs to take advantage of the program, and wanted to give increased consideration to focus on transit options that complemented the Main Street Transit Mall, which was a result of the METRO board's Downtown Mobility Study. Main Street was intended to be constructed as a four-lane, bus-only, facility. The board also felt that a DPM-like system "may well be appropriate at another time in the CBD, or in other Houston activity centers where Bus Priority Systems would be more difficult to implement." The Main Street Mall was intended to have capacity for at least 150 regional express buses per hour. In the past Houston has never been one to aggressively pursue alternative forms of transportation, given the influence of oil companies here in Houston, much like the auto manufacturer's influence in Detroit. But this was probably one transit project that we can be glad was never built, at least in terms of function. METRO's Greenlink bus service essentially provides the same service as a people mover would have, but likely without the same service times, and at a much lower cost, with almost no added infrastructure. It also covers most of the same ground that several of the routes in the Houston people mover's preliminary report. But, I can't help but think that Houston may have missed out on having a unique form of transit within its downtown. As is the case with Detroit's cold winter weather, a system like this would certainly be a comfort for downtown workers and visitors in Houston's extreme heat. It sure would have made for a much better conversation piece than our current clogged (during rush hour!) downtown streets, and would allow people to traverse the city above ground and at street level, as opposed to through Houston's tunnel system. Now that the METRO rail is almost complete, it's not too late to add this to Houston's transit wish list! Below is a collection of snapshots (I apologize for any poor quality photos) of the City of Houston's proposal for the Downtown People Mover program proposal, as well as supporting documents, including the Preliminary Report for a People Mover System for downtown Houston, and the preliminary engineering grant application. Finally, captures of the METRO Houston Downtown Mobility Survey are included. All items are available for view at the Houston Metropolitan Research Center (HMRC), located within the Julia Ideson Library in Downtown Houston. Unfortunately, unlike Facebook and Google+, Pinterest does not allow you to set up multiple pages under one account. If you have three websites that use Pinterest to market products, you need three separate Pinterest accounts; four if you have a personal Pinterest account, too. Not very convenient, to say the least. To start, go to Pinterest.com. There are many individuals that want to relocate from one place to another. They hire the adept services of movers pimple saudagar to move their home without any hurdles.